Two-Sentence Summary In Storybrooke, Hook is enlisted to help Ariel reunite with Prince Eric, but the captain is carrying a dark secret about the prince’s fate and his own quest to return to a pirate’s life during the lost year in the Enchanted Forest. When Ariel is revealed to be a shape-shifted Zelena, Hook is cursed to remove Emma’s magic if he ever kisses her. My Thoughts “True love isn’t easy,” Prince Charming once said (in Season One’s “What Happened to Frederick,” which was coincidentally written by David H. Goodman, who also penned “The Jolly Roger”). The same can be said of becoming a better person, embracing your true self, and learning to let go of your past. But when has anything easy ever been worthwhile to watch when it comes to character arcs? Let’s not bury the lead here: This episode hurt. I’m still sad about it more than twelve hours later. But I love that I’m this broken-up about it because it means the writers and the actors did their jobs. If it’s done correctly, I love angst. And by “correctly,” I mean, “brought about with believable choices made by characters acting consistently to what we know about their pasts and their current motivations.” And “The Jolly Roger” was nothing if not consistent in terms of its characterization. I understood every choice made in this episode by its featured players, and that’s all I ask for. The central theme of this episode tied into what is appearing to be the overarching theme of this half of Season Three: You can’t go back. Zelena wants to literally change the past. Charming wanted to go back to being the “cool grandpa” he was when he taught Henry to swordfight and ride horses. Emma wants to return to the life she and Henry led in New York City. And Hook learned the hard way that you can’t run from the pain of the present by desperately trying to rekindle the past. Why don’t we start with Charming’s misguided attempt to re-create the bond with Henry that drove both of their stories in the first half of Season Two. It made so much sense that it was Charming who would be the most upset by Emma confiding in him that Henry prefers to spend time with Hook. Snow loves her grandson, but Charming developed a much closer bond with Henry. Yes, Charming has his daughter (Anybody else adore the scene with them trying to put together the crib? ), but something is missing without his grandson, and he’ll do anything to fix it—including teaching Henry to drive his truck. Was it an incredibly stupid move? Yes. Was it potentially dangerous? Yes. But was it unbelievable? No. It left me shaking my head like Snow (Ginnifer Goodwin was the queen of reaction shots in this episode), but I understood Charming’s motivations. And it gave us Regina’s perfect mother/mayor moment of trying to cover up her concern. I’ll say it a million times because it can never be said enough: Lana Parrilla is doing brilliant work—even more brilliant than usual—in this half of Season Three. Parrilla was characteristically excellent in her scenes with Jennifer Morrison as well. In an episode that was all about attempts to re-create the past, I loved that Emma’s magic lessons were about the present. When Regina and Emma get together, they mean business. Regina talked about Rumplestiltskin not suffering fools, and it’s clear that the student has become the teacher in that regard. Her no-nonsense dismantling of Emma’s attempts to deflect the conversation about Hook was perfect. Regina knows what it is to be a woman who runs away from love, and I liked that she was trying to get Emma to accept that she’s doing the same thing. And the way she forced Emma’s hand with the bridge lesson was an interesting way to show us that Regina knows Emma’s magic is different from her own; it’s protective instead of destructive. After an excellent Did I just kill the savior? reaction shot from Parrilla, Emma saved herself, and, in doing so, she seemed to have become more comfortable with embracing her true self—her magic. Emma was the one who wanted to learn how to work the mirror’s magic in the apartment, and Regina admitted that Emma could do it even though she couldn’t. Emma’s magic—magic that came from true love and is motivated by protection—is different than any other we’ve seen on the show. I’m excited to see light and dark magic working together as Regina continues to help Emma access her magical abilities because it’s such a great symbol for these women who have always been foils for each other—two sides of the same coin. My favorite small moment of Regina’s was when she told Snow that Zelena wouldn’t be able to harm her unborn baby after she cast the protection spell. There was no sense of Regina wanting credit for doing something so different from what she had done 28 years before; there was just a subtle acceptance between these two women that Regina has changed. Regina isn’t going to deny who she was, but her actions in the present prove that she has grown—and she’s grown into a character I really enjoy rooting for. Speaking of character growth, I think it’s time we started talking about this episode’s hook (horrible pun intended): What has our dear Killian Jones been hiding? I was convinced that it was something completely innocuous, something he was hiding from Emma to keep her from feeling indebted to him or to keep a few of his cards still close to the vest until she shows her hand in terms of her feelings. I thought his lines about going back to a pirate’s life were a big cover-up for looking for Emma as soon as he could. I thought these flashbacks would reveal him to be a hero. I have never been so happy to be wrong. Perfect characters are profoundly boring to me because they are profoundly unrealistic. Give me characters who make mistakes and bad choices because we can see them learn and grow. And that’s who Hook is—he’s imperfect; he’s human. And humans screw up. I’m not saying I enjoyed watching Hook slide back into old habits, but I did feel like it came from a believable place. Everything he did in this episode was consistent with who we know him to be as a character; I understood all of his motivations, and so much of that came from what I think was Colin O’Donoghue’s best work on the show to date. 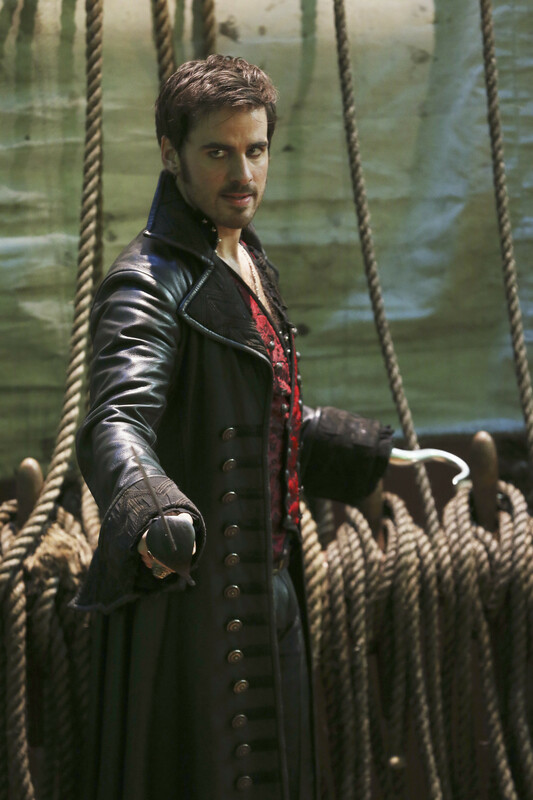 From the beginning, we know this isn’t the same Captain Hook from his former pirate days. I loved the scene with Hook and his “gift” because it showed that there are parts of a pirate’s life that he knows from the start he can never go back to. He’ll keep up the appearance of womanizing, but no amount of pirate bravado can change the fact that he promised Emma he would never stop thinking about her. That promise drove him to a kind of fidelity we always knew was a part of his personality (this is a man who stayed faithful to one woman’s memory for 300 years), but it also drove him to a darkness that we always knew was a part of his personality, too. Once Upon a Time is very clear about what happens to people when they lose love: It turns them into people who try to forget their best self—the parts of them that flourished when they were around the one they loved—because it’s too painful. Hook doesn’t help Ariel because he wants to be a hero; he helps Ariel because he wants to prove himself as a pirate again because he feels lost without Emma. O’Donoghue perfectly captured Hook’s desperation to return to the ship—and the life—he held before Emma. He was helpless in the face of losing her, but he can take action to get his ship back. His ship had been the one constant in his life for 300 years; it’s the only love he’s been able to hold onto. The fun was soon interrupted, however, by a choice Hook could never take back. He chose to kill Blackbeard and resume his place as captain of the Jolly Roger, believing that this would lead to Prince Eric’s death and the loss of Ariel’s true love. (Fear not: We later learn they’re alive and well—and living happily ever after.) I think we can all agree that this wasn’t the hero’s choice, but it was a realistic choice for a man who has been through all that Hook has been through. When Ariel appealed to Hook’s understanding of true love, I wanted to scream at her that this wasn’t the right negotiating path; Hook just lost the woman he’d hoped could be his true love, and he sees no value in that concept anymore. Being a hero—believing in love—has never led to anything good for him. Being a pirate is a well-worn path for him; it’s how he deals with the emptiness that has always come from losing love (Liam, Milah, and now Emma). The Jolly Roger is his, and he has nothing else. Emma was his light after 300 years of darkness, and without her, the darkness took hold again. Everybody lost the day Emma and Henry were separated from them—heroes, villains, and pirates alike. So for Hook, the hero’s path wasn’t one of value anymore. He chose the only path he still thought he understood: the pirate’s path. It was the wrong choice, but I’m happy he made it in terms of his character arc. The path to becoming a better person isn’t a straight line. Nobody has a perfect journey towards becoming their best self; we all falter, struggle, and even fail. Hook’s journey felt real because his struggle felt real. O’Donoghue made me believe Hook’s sense of emptiness, and his desperate need to fill that emptiness with something tangible—his ship and the life it represented. But he also made me believe that he deeply regretted that choice, which is a huge stepping stone on the path to becoming a better man. As soon as Ariel leapt into the sea to find Eric, Hook knew he’d made a mistake; he knew he couldn’t be that same pirate he once was. He’d learned there was still good inside of him during his time with Emma and her family, and he’d learned he still knew what honor was. The fact that he acted so dishonorably with Ariel was a secret he carried with crushing guilt from that moment on. I feel like all of Hook’s cagey behavior concerning his missing year makes so much sense when you think of it coming from a place of extreme self-loathing and guilt. O’Donoghue was so good at showing in the tense way he carried himself throughout all of his interactions with Storybrooke Ariel that he was horribly guilt-ridden by what had happened to Eric. And when he ran back to her, pleading for a way to right what he saw as one of his most egregious wrongs, I wanted to cheer for this character and how far he had come. Hook has always been one of the show’s most self-aware characters, and he knew that what he’d done deserved no less than the painfully honest confession he made to Ariel. Hook didn’t try to make amends with Ariel for Emma. He wanted to make things right with her because he knew he’d done a terrible thing and couldn’t live with the guilt anymore. It was a moment of genuine character growth, perhaps Hook’s finest moment on the show so far. He wasn’t trying to be a hero; he was just trying to be a better man—not for Emma but for himself. Being a pirate left him as empty as his quest for revenge, but he still knew one thing about himself—one good thing in a sea of self-loathing—he still believed in love. When Hook bowed his head and admitted he loves Emma, you could feel the weight of all of his 300 years in that moment. He spent the flashback trying to do anything in his power to return to the man he was before loving Emma, but that one, pained “Yes,” showed that what he told Emma at the beginning of the episode is true: You can’t go back to who you were; you can’t pretend things never happened just because those things caused you pain. Hook can’t deny loving Emma because it’s the one part of his identity he knows—he’s not a pirate anymore, he’s not a hero, but he is a man who can love. But that ability to love turned out to be yet another path to pain for Hook. It wasn’t until Joanna Garcia Swisher (who was brilliant in this episode) smiled an evil little smile when talking about Hook’s broken heart that I knew the twist was coming, and I loved that this show can still manage to surprise me. Zelena preyed on Hook’s remorse and love—two of his best traits. And by corrupting Hook’s love for Emma and her family, Zelena finally became a villain I could hate. She was a campy witch with a relatively boring backstory before, but now she made it personal with my favorite characters. I have a lot of questions that I hope will be answered about the plot-related reasons for Hook’s cursed state (especially in terms of what exactly Zelena wants—not just with Emma but with everyone). But my moments of frustration over having so few answers about Zelena’s actions were balanced by the weight of the emotional ramifications of this curse. Hook has always been the one character to embrace all that Emma is. In the beginning of the episode, we saw him beaming with pride over her magical abilities. When he watched Emma perform the mirror spell, Hook knew he couldn’t do anything to jeopardize this beautiful part of her that she was finally starting to embrace. I’m convinced that he wanted to tell Charming right away—it’s why he went straight to the apartment—and I think he’ll tell him in the next episode. But I think we’ll be seeing the angst with Emma go on a little longer. From a character perspective, this curse is the key to Emma finally moving out of her state of denial about how deeply she cares about Hook. The end of this episode made it abundantly clear that she wants him by her side. By calling him Killian out of Henry’s earshot, she acknowledged that she sees him as more than just a pirate. And by telling him that she was tired of living in the past, she wanted to give him hope. By accepting her magic, Emma is starting to accept that she is more than a woman who is haunted by her past, and she wants to choose her own future. Emma is ready to begin to move on, and she is trying to tell him in her own guarded way that she thinks she could do so with him. So when Hook walked away from her, leaving her alone with the yearning look she swore to Regina she’d never wear, it hurt because I felt the pain of both characters. Emma is a woman who fears abandonment, and Hook is leaving her behind just as she started to open up her heart to him. And Hook knows how much walking away would hurt her, but he thinks it’s what he has to do. Hook standing alone outside of Granny’s was such a poignant image. Hook didn’t belong back in a world of piracy; he belonged with these people—with this woman. But he’s convinced that he isn’t meant to have happiness; he is now a man whose love is literally cursed. I hope he tells someone his secret soon, and I hope Emma finds out before too long. It’s one thing to keep things dramatic for a little while, but not telling Emma takes away her agency again. However, I think Zelena underestimates Emma—not in terms of her magic but in terms of her ability to love. True love’s kiss can break any curse, so I have a feeling Emma will be choosing to kiss Hook before the season is done, breaking his curse and solidifying them as another Once Upon a Time power couple. Starting with the non-Hook thoughts, I love Regina more and more with every episode. I love that she’s taking such an active role in protecting the Charmings’ baby and that she and Emma have been working so much together. I would really like to see the two of them work together to defeat Zelena. Emma may be the savior but Regina is the one that Zelena has a more specific grudge against and I want her to get to be a hero and be recognized for it. I was not expecting Hook’s secret to be that big and I’m a little excited that it was for the same reason you mentioned – it was believable. Losing Emma hurt Hook and made him directionless so he resorted back to the only life and identity he was comfortable with. He tried to be the fearsome Captain Hook again but he realized that he didn’t fit in with that life anymore. Unfortunately, he realized this a little too late (or so he thought). Hooray for solid character development though, in that he realized his mistake and sincerely regretted his choice. That’s what I want to see from the characters I love. His confession to Zelena was some of Colin’s best work and was completely heartbreaking to me. Now that Zelena is more directly going after Emma, I find it a lot easier to dislike her. I don’t necessarily understand her endgame but when you mess with the happiness of my favorite character, I get a little defensive. She is letting her guard down and opening herself up to the life and love that Hook is offering her and Henry and Hook suddenly pulling away is going to hurt. I know she’ll find out eventually and I like the idea of her fighting Zelena so she can have a happily ever after (yay for agency) but I don’t want to see her put those walls back up, even temporarily. I want that Beckett-like leap into happiness for her so badly. Have I told you lately how much I love the ways we agree on so much about this show (and really all shows)? Between comparing Beckett and Emma and a certain other sword-fighting handsome devil with Hook, I love that we even make the same comparisons between our favorite characters. What you said about it being a lot easier to dislike Zelena now is so true. I felt amused by Rebecca Mader’s campy performance before, but now I am 100% invested in seeing her defeated. Like you said, you don’t threaten my favorite characters and break them even more while getting away with it. This was how I wanted to feel after Zelena’s flashback episode, so I’m happy that i didn’t have to wait long to fully embrace my anger towards her. And I join you in your hope that both Regina and Emma play roles in defeating her. Yes, Emma is the savior—and she needs to break Hook’s curse—but Regina is the one with the personal ties to Zelena, and I want to see her have the satisfaction of helping directly to bring her down. Hey NGN I wanted to let you know I find your reviews phenomenal. You are able to take the complexity of the show most of us internally know is there, but manage to externalize it in writing wonderfully. (and not to mention so quickly!) With the way critics have written off OUAT, the show deserves a writer like you getting everything the geniuses behind the show intend. Thank you for some of the best tv reviews I’ve read! Thank you very much for the incredibly kind words! It depresses me to read negative opinions on this show from many media outlets because it always feels like they would rather be cynical instead of embracing the ideas of hope and love that drive this show. I’m so happy that you appreciate my love for this show because I really enjoy sharing it with all of you! I really liked this episode, and I agree Hook betraying Ariel was in character. When we saw how much Hook regretted his decision that’s when we know Hook had truly changed. I am 100% behind CaptainSwan & before this episode aired I did think that something would have to happen to move the relationship along as there’s only so long that Hook can do all the running. Emma needs a push before she will admit her feelings – in S1 Henry had to go into a sleeping curse before she could admit she loved him, and it was only when she thought they were all going to die at the end of S2 that she called Snow & Charming Mom and Dad so I really think that Hook will have to be in some serious peril before she admits she loves him, that said I definitely think it will happen by the end of this season. Loved seeing Regina teaching Emma magic – I can’t commend the writers and the actresses enough for how they’ve developed this relationship during the season. If you had told me during S2 that Regina would be an integral part of the Charming group I would have laughed! This week I didn’t blink twice when Emma said she would ask Regina cast a spell to protect Snow’s baby, and then Regina cast the spell and perhaps more surprisingly she WANTED to do it. And it’s only after Regina points out to Emma that everyone sees the yearning looks and doe eyes between her and Hook that Emma for the first time actually admits that it’s true, and finally at the end of the episode Emma tells Hook she’s ready to move forward, showing how she’s learning to look for the good moments among the bad moments. During this episode Emma and Hook have both shown how much their characters have grown this season. I fully expect there will be some CaptainSwan angst in the next couple of episodes but I also expect that by the end of the season we’ll know for sure that Emma loves Hook as much as he loves her and they will share share True Loves Kiss. I personally can’t wait to see how this season will end. Thank you so much for the comment, and I agree with so many of your points. I also agree that Emma tends to need a push in order to reveal her love for people, so this will definitely help her along. However, I thought it was beautiful that she was starting to get there without a push when she told Hook that she wanted to move on from the past; it was a huge sign of growth for Emma. I also agree with what you said about never believing that Regina would be an integral part of the Charming family, but now I love watching her work with them. She fits right in with this little family unit, and she especially works well with Emma, which is such a welcome and lovely change from their previously antagonistic relationship. Like you said, I can’t wait to see how all of this progresses as the rest of the season unfolds! Loved the episode as much as it hurts. Just wanted to share this thought with you all (particularly any cs shipmates): I’m actually glad Hook betrayed Ariel. Before you call me crazy, here me out. Hook helping Ariel would be for the greater good, and in the greater good, someone is always slighted, usually Emma. Hook doing what he did though is better for Emma as the Jolly Riger was obviously instrumental in getting to her. And, for once, someone chose her above all else, even the greater good. Yes, it was selfish of him, but that’s not always a bad thing. Thanks for the comment! That’s a really interesting way of looking at Hook’s choice and his priorities. I’ve always liked the idea that Emma finally has someone in her life who would choose her happiness above everything else—even heroic ideals like the greater good. It’s why I think it’s a good thing that Emma is loved by someone less than perfectly heroic; she’s been sacrificed for the greater good so many times before. That’s also why I hope Hook tells her about Zelena’s curse soon; she deserves to know, even if her knowing puts their mission at risk. I think at the beginning of this season I mentioned that ‘Once’ is pretty obvious about its overall story arcs, but how they get from point A to point B is always a surprise. That really cant be more true about this episode, which completely blindsided me. The fact that Zelena was masquerading as Ariel in Storybrooke is probably most suprising twist in the history of the show for me. As someone who has trouble staying away from spoilers (West coast living makes it HARD), this was one of the few plot points that I had no idea about going in. I find it even more amusing that it still caught me off guard, because I kept thinking to myself throughout the episode, “Ariel is acting a little weird” and I still never suspected that was why. I thought it first on the beach (I thought Ariel would have been way more excited to see Snow again) and I thought it again in Gold’s shop (how did Ariel know about Mr. Gold? Maybe they briefed her on the short walk from Grannies?). And yet, still floored. As soon as she gave Hook that evil grin I started violently punching the couch pillow and was yelling “NO!” at the TV, and I rarely get that emotional about TV. As you laid out quite well, I thought everything Hook did in the EF was perfectly in character. Heartbreaking, but in character. His line when sending Blackbeard off the plank about having something tangible (his ship) being of more value to him than the risky and intangible (“Love brings nothing but wasted years and endless torment”) killed me, especially when compared to Hook’s confession in Emma in Storybrooke about not being able to go back to your old life. I thought all these scenes were great, and I especially loved Ariel. I thought it was completely badass how she just sauntered off the plank like no big deal and everyone’s jaw was kinda on the floor. Even Hook’s pleading with Zelena/Ariel was painful in the best way. Unfortunately, where this episode fell apart for me was the final scene in the loft. I am having a really really hard time accepting Hook’s decision not to come out and tell Emma the truth about what happened. I also believe that he was going to the Charmings to tell them what happened, but still, it bothers me that he didnt tell the truth. In the scene in the hallway when Emma states that she doesnt care what happened in the past, it was a great step forward for Emma, but the fact is, they arent in the past. This is the present, and in this present Hook made that conscious choice to deceive her and take advantage of the trust she had given him. Maybe its not much different than what Emma is doing to Henry (keeping him in the dark because she thinks its safer that way even though its not safer and its just selfish) but it seriously pains me to see Hook choose not to tell her. There is also the disappointment that this episode only showed us half of Hook’s year, and I was expecting to see the whole story. This showed us Hook trying to go back to his old ways, but not the moment he realizes this path is empty and decides to go back for Emma. Hook’s story is still unfinished, and I am trying my best not to pass final judgment until we know the full story, but I am not very good at waiting, haha. I loved seeing the Charmings and Regina having a family dinner together at the close of this episode. They were smiling, Emma was laughing. They were enjoying a happy moment amidst the chaos. Its moments like these that I understand why there is such a rabid following for SwanQueen. Hook and Robin didn’t really feel missed. Blackbeard got the Repunzle treatment, but the swordfight was fun, and I like how Blackbeard and Ariel kind of played the angel vs devil on Hook’s shoulder as he grappled with his conflicting Pirate and Hero sides. Apparently everyone and their mother knows about Hook’s feelings for Emma. His crew, Blackbeard, Ariel, Zelena. I wouldnt be surprised if Cora’s ghost has something to say about it next week. Next week has Regina and Snow teaming up. Really looking forward to that. I was trying to figure out if this cursed kiss thing is supposed to be a play on Ariel’s story about having to earn true love’s kiss in 3 days or be Ursula’s garden slug forever, or if its just a random contrived plot coincidence. You bring up some (characteristically) awesome points, Shauna! As you know, I’m a total spoiler fanatic when it comes to this show, so I loved the fact that there can still be twists and gasp-worthy moments that surprise me. I’m actually going to brave the emotional torment and watch this again before Sunday with the knowledge of who Srorybrooke Ariel really is because I have a feeling it’s going to make me appreciate Joanna Garcia Swisher’s performance even more than I already do. Speaking of her performance, thank you for bringing up how awesome Enchanted Forest Ariel was because I wanted to talk more about her but ran out of time while I was writing. Her determination to find Eric on her own showed the kind of self-sufficiency that all of these female characters have, and I loved that it was rewarded with her actually finding her prince. I love the “princesses saving their princes” role reversals that this show has become so fond of. The more I think about it, the more I realize I am being too harsh on Hook. Even the poster “true love” relationship on this show of Snow and Charming have kept things from each other when in similar situations. I am pretty sure if you put any of the other show’s couple’s in this situation they would have acted in a similar fashion. Is it a bad reaction? Yes. Is it understandable? Sure. But do I want Hook to be above that and not make the same stupid mistakes as everyone else? Yes. I am just letting my frustration over not knowing how this is going to play out get the better of me. I am a person that used to think Full House was too stressful and has to look up the ending of any thriller movie 20 minutes in because I get emotionally overwhelmed. The fact that you used to think Full House was too stressful makes me believe we are kindred spirits. I once turned off the animated movie Cats Don’t Dance as a child because I was too emotionally overwhelmed by the idea of the main cat giving up on his dream to keep watching. I liked your review and agree with your points about Hook’s character growth. The thing that stuck out to me and worried me the most about this episode was the fact that Hook didn’t tell Emma the whole truth about Ariel and Eric. Emma now thinks that Hook helped Ariel find Eric and when she finds out the truth, she’s going to be very upset. I know she said that whatever he did in the past doesn’t matter but in keeping in line with her character, she will not be okay with Hook lying to her. Emma doesn’t trust people easily and she’s only recently really started letting her walls down with Hook. I think she would’ve moved past what he did if he had just told her, instead of letting her believe he had actually helped Ariel. But now, I don’t know. I know that this is supposed to cause angst between them but I think it’s going to take a lot more work and time for Killian to gain her trust again. On another note, I loved the part when he flirtatiously told her she didn’t have to use Henry as an excuse to see him. To be fair, Hook did actually tell Emma the truth that Ariel found Eric by herself, it’s not his fault that she chose to think otherwise. Maybe if Regina hadn’t been there, he would have told her but he’s not one for sharing important things in front of other other people, he prefers to speak to Emma alone. As for Emma not liking it when she finds out, I’m not so sure anymore. She seems to understand him quite well and though she might be a little disappointed, I don’t think it’ll ruin anything in their relationship. Everyone makes mistakes and I think Emma knows that as well as anyone. Ah ok, I didn’t remember hearing that part where he did tell her the truth. I think I was too busy yelling at the TV for him to tell her about the curse and everything. I only heard what Emma assumed. I thought he said he had helped Ariel find Eric. And you’re right about Emma knowing everyone makes mistakes. So I guess we’ll see. Thank you for the comment! I understand your concern about Hook not telling Emma the whole story about Ariel and Eric, but he did tell her the truth; he just didn’t correct her when she chose to believe he was being modest (which isn’t much better, I know). Part of me wonders if he would have told her everything had they been alone—because Hook is not one for publicly showing vulnerability (as we’ve seen time and again), and we know that this is something that brought out the most vulnerable side of him we’ve seen yet. But that doesn’t excuse him completely. However, I think he’ll have bigger problems with Emma if he chooses not to tell her about the curse he’s under. Hook has always been honest with her, and I just hope the secrets don’t hang between them for too long. I agree that Hook would’ve told Emma if they were alone and like you said before, he was there to tell Charming already. I just hope he tells her soon about the curse and it doesn’t turn into this long drawn out thing where he avoids her and doesn’t talk to her. Every week I look forward to your reviews and this week didn’t disappoint! I wish I could articulate myself as well as you when it comes to this show but I couldn’t even come close. Minor irritation for me in this episode was actually the whole kiss curse – just seemed a little…pointless, as curses go. I understand it’ll probably propel Hook and Emma’s relationship further and I’m guessing that is really why it was done but it was pretty weak as an overall threat as, personally, I just didn’t feel that worried for the pair. I was more concerned for Snow when she took that potion to stop her having children and I already knew that she’d gone on to have Emma, so yes, this curse fell a little flat for me. I feel the same way about the curse, if I’m being honest—but that’s been the way I’ve felt with most of the villainous actions on the show. We know the villains will be defeated and the curses will be broken, but somehow the show manages to still throw in enough surprises and emotional impact along the way to make it all worthwhile. I’m definitely looking at this curse more as a path to character development than any sort of huge plot predicament, as I’m pretty sure it will be broken with true love’s kiss at some point. But I’m sure there will still be bumps and twists along the way to keep things interesting. Your reviews are AMAZING! Thanks for taking the time and putting in the effort to write this. I agree with just about everything you said. This episode showed great and believable character development for, not just Hook, but also Emma, Regina, and Zelena. The only thing that I felt was a little off was when Zelena started to monologue about Hook’s curse. It felt unnecessary, since Hook is more likely to kiss Emma if he doesn’t know what the curse did to him, or would do to her. Also, I noticed that, ironically, Blackbeard didn’t have a beard. Villain monologues always drive me crazy from a logic perspective, but I suppose if they’re delivered by actors as talented as Rebecca Mader it makes them at least entertaining. 😉 And I can’t believe I missed the irony of Blackbeard not having a beard! You’re right about it being entertaining when delivered well. Rebecca Mader is a seriously good actress. But anyway, I just realised that in some way it is logical that the Wicked Witch would start to monologue. She’s driven by envy and jealousy, which means that it’s probably REALLY tempting to gloat over someone she just cursed. She enjoys the suffering of others. I agree about how painful this episode was in terms of Hook but I enjoyed it a lot, also. I really should have expected a slide backward, since that happened with Regina as well, and the show loves to throw in wrenches to keep paths from being completely smooth. I think this was probably a good lesson for Hook to learn – he can’t go back to who he used to be because that guy he used to be, the one who only needed his ship to be happy and didn’t care about the damage he did to others to get it, doesn’t exist anymore. He tried to go back, he did exactly what he would have done pre-Emma, and all he ended up with was massive guilt and shame, things he would not have felt at all before. I like that they showed us that, too, because it’s one thing for a show to just say Hook is a good guy now, and another for them to demonstrate how it happened and show “proof” that he’s changed. I appreciate everyone unhappy with the backslip, but it feels more authentic for them to show him stumbling and then show how that stumble affects him now, as opposed to how it would have affected him before, I guess. It’s showing instead of telling, which is something I enjoy, even when it’s painful. Especially when it comes to things like character growth, because looking at what happened here, I can go “yeah, okay, I can see how he’s changed” and I have a much harder time with “everyone just trusts him now, so he must have changed.” Same with Regina – I prefer them to show how she has changed and why she has changed, as opposed to anything else. I liked that Emma assumed that Hook would be joining the family dinner and that she seemed to sense that something was off with Hook when he refused. I suspect that Zelena’s curse is setting up a “true love’s kiss” for later, but I have no idea how or when it will come about. That was a twist I did not see coming! I like it when the show throws curveballs and keeps from being too predictable and this one threw me for a loop. I have no idea what Zelena really wants, it’s refreshing. Speaking of Regina, she had some great scenes here. I loved Emma and Regina’s magic lessons. Those two always have great chemistry when they’re paired together, and I like the thought of Regina getting to be the teacher and pass on her knowledge to someone else. Especially to Emma, who is finally opening up enough to learn. I also liked Regina expressing frustration that Emma has so much natural power at her disposal but she won’t use it, because it reminds you that Regina put a lot of work into developing her own talents and that’s how she got to be as powerful as she is. I actually pretty much liked everything to do with Regina this time around – her scene with Snow, promising Zelena wouldn’t get the baby, her scene with David and Henry were mama!Regina came out at the thought of how dangerous that was, and especially Regina at the end, getting to have family dinner with everyone. I’ve wanted Regina to be “part of the family” for a long time, so it was really great. We even got great Charming family bonding scenes as well, with Emma and David putting the crib together for Snow. This episode was a good one for character meat, I think. Thank you so much for sharing your thoughts with us, and I agree with you on so many points. Your preference for showing rather than telling in terms of character development is one I share—it’s a mark of good writing to allow your audience to see a character growing and learning from their mistakes instead of just hearing that they’re different than they were before. It makes character growth so much more believable, and it always helps when you have an actor as talented as Colin O’Donoghue (and also Lana Parrilla) making that growth clear through their acting choices as well. I loved what you said about Regina’s frustration with Emma not making full use of her powers. Regina had to work so hard to succeed at magic, and to see Zelena and Emma both take to magic so easily makes Regina’s struggle and ultimate success in using her powers more relatable because we got to see her work for it (which sounds weird to say because that magic was used to cause so much destruction—but such is the nature of my complicated relationship with all things Regina). This was a very strong episode for character development on all fronts, and that’s why—even though it broke my heart—this was one of my favorite episodes of this half of Season Three. Thank you very much for the kind words! I definitely try to make my posts different from the standard recaps that most sites write, because, like you, I always felt like I didn’t need just a rehashing of what happened—I wanted to analyze and go into more depth about what happened. I’m so happy you enjoy that as well, and I’m glad you found us, too! So I think I now realize what took me all week to respond. I am struggling with the show post Neverland. I watched last week, I read all the commentary breakdown here over the course of the week and then went back and watched again this morning and I am still struggling. Here’s my breakdown on the holes I find in Storybrooke Redux. 1) Zelena – I love Rebecca Mader and the commentary here has helped me reshape a bit of my perspective. But while I understand the camp side of the character play I feel like she’s overplaying her hand. What made Regina such a great villain (and Rumple for that matter) was their ability to be menacing without being completely manic. In the most pivotal scene of the show – when confronted by Hook on the docks after the curse she just seemed ridiculous to me. The over exaggeration of her line readings didn’t match Hook’s tone. I get that we are suppose to hate her, but like a flawless hero and villain who is just one note also quickly loses steam. To your earlier points, her backstory was less than compelling and the lack of depth/motivation leaves her actions hollow for me. 2) What happened to Charming and Snow? Are we sure they didn’t stay in Neverland. It’s like they are sleep walking through this part of the season. Snow is without any of the smart belief she always balanced and has merely come off as gullible lately. I appreciated your point about the arch of the back end of the season being driven by the concept that you can’t go back. It’s a great lesson that all our characters need to learn. It makes the scenes with Henry work better for me. However, especially given Charming’s recent bought against his own fears I find their being on the back burner a struggle, because it has pulled them out of the characters I have grown to adore. The bright spot for me continues to be Regina. I love the way they have managed to bring her into the trusted fold without changing the essence of who she is. She may have been the evil queen, but her evil always had a purpose. She was driven by love – misguided though it might have been at times. I think that is my struggle with this arch of Zelena. I don’t know what is driving her evil and as a result it falls very one note for me. I don’t believe she loved Rumple, I believe she was infatuated with him. Her absence of love and motivation that ties into the lore of the show leaves me nonplussed. I am eager to see this week’s episode given the subject matter. But I’d be lying if the quandary that is our new villain isn’t leaving me a bit perplexed. I feel like the folks in Storybrooke, I am missing a year of information that allows me to enjoy this dominant plot point. I think we have been spoiled with really complex interesting villians, and the wicked witch just isnt meant to be that complex. I didnt really think Peter Pan was all that complex either. If anything I am disappointed at how similar the WW is to Peter Pan. I just see them both as selfish brats. I think this show works much better when it focuses on the group rather than focusing on individual characters, and 3B has been focusing a lot on individuals. I think now that the set up is here, things are going to move quickly in the last few episodes of the season and I hope it finds it’s stride again. They have this amazing cast of really complex and interesting characters but it definitely seems like they are having a hard time finding a way to properly balance all of them. I love Hook, but his past character exists kinda outside of the others, so his focused episodes tend to feel more unbalanced than normal to me because you dont get that plot crossover you get with the others. Season 3 has made me love Regina. Tomorrow’s ep even more. I hope it reinvests you! Shauna I think you are right about the over complexity quandary. Given who the creators are, I am willing to give them a ton of rope. So I haven’t divested of the show, but just as LOST struggled with new character additions after spending so much time having me invest in that first wave of characters a bit of history is repeating itself here. I think the difference for me was at least in Neverland and prior to now that interaction of the characters was woven into the plot and this part of the season has felt very isolated in its storytelling. I did love the pure evil of Pan and the reveal of him as Rumple’s father was gravy. I think that is why it worked better for me. Pan was evil. Period. I didn’t need to know his backstory and I didn’t need to invest in him because as you pointed out we had the complexity with Regina and Rumple to represent that evil isn’t all it seems on the surface. I think that the creators have done wonderful things with Lana Parilla’s talent and character this year. As someone who was always in the camp of Regina being misunderstood I am enjoying people and the show opening up to her. That’s been fun to watch. Given your tweets yesterday, I am eager for tonight’s episode. And perhaps my disappointment this week has more to do with coming off the unexpected emotional peak that was Neal’s death.